Learn about early Chinese philosophy this Lunar New Year with Associate Professor of Philosophy at the University of New South Wales, Dr Karyn Lai. 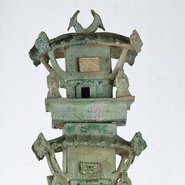 Looking at one of the treasures of the Gallery’s Chinese art collection, a detailed 2000-year-old model of a watchtower, Dr Lai will introduce some of the fundamental ideas in ancient Chinese philosophy. Pottery models of buildings, animals and people were made to furnish the tombs of rulers and royalty in early China. The tombs therefore became a replica of the deceased’s life on earth. This talk will highlight how 1st and 2nd century Chinese people viewed life, both in the present and in the afterlife, and their philosophical views on harmony and continuity. Funerary sculptures like the watchtower, as well as models of homes, animals, household goods, wells and granaries, dancers, musicians, soldiers and horses, represented the way that high-ranking citizens prepared for life after death. Dr Karyn Lai is Associate Professor of Philosophy in the School of Humanities and Languages, University of New South Wales. Her primary research area is in early (pre-Qin) Confucian and Daoist philosophies. Her books include Introduction to Chinese Philosophy (2017, Cambridge University Press) and Learning from Chinese Philosophies (2006, Ashgate Publishing). Her work draws insights from Chinese philosophies to address issues in a number of areas including moral philosophy, environmental ethics, reasoning and argumentation and epistemology (the study of knowledge and beliefs).